Going to National Society of Histotechnology in D.C.? Reply to this email and send us a photograph of anything close to your heart (a child, loved one, pet or your first car) and we will print it on a customized cover cap for the center of your microtome or cryostat handwheel(First cap free, additional caps are $5 going to the American Cancer Society). Our customized cover caps fit perfectly on many Leica, Microm and Sakura microtomes. All you need to do is simply come to our booth, collect your free cap and put up with 1 minute of our tasteful groveling for your business. 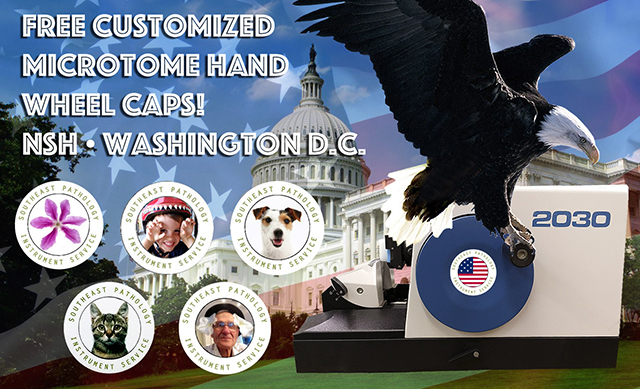 We will also have our stamping machine on hand for punching out pre-designed hand wheel caps. Give it a whirl! With 9 highly trained technicians, Southeast Pathology Instrument Service is the leader in providing professional service on histology instruments throughout the South Eastern United States. We also remanufacture and distribute top end histology instruments throughout the United States and aboard. LEICA: PELORIS, BOND, ASP 300, TP1050, TP1020, CV5030, CV5000, XL STAINER, ST 5010, ST5020, ST 4040, IPC, IPS, EG1160, EG1150, EG1140, RM 2025, RM2030, RM2035, RM2135, RM2145, RM2155, RM2165, RM2235, RM2245, RM255, RM2265, ULTRACUT E, ULTRA UTC, CM3050S, CM3050, CM1950, CM1900, CM1860, CM1850, CM1850UV, CM1800, CM1510, CM1510S. SAKURA: VIP 6, VIP 5, VIP E300, VIP E150, VIP 1000, VIP 2000, VIP 3000, PRISMA, DRS200, DRS601, G2, GLAS, FILM, SCA, AUTOWRITE, TEC 5, TEC 4, TEC 3, SRM, CRYO3, CRYO2000, TISSUE TEK 4553. THERMO / SHANDON: EXCELSIOR, PATHCENTER, GEMINI, CLEARVUE, FINESSE, CYTOSPIN, MICROWRITER, HISTOCENTER 3, CRYOTOME E, CRYOTOME FE, CRYOTOME FSE, GROSSLAB SENIOR, GROSSLAB JUNIOR. MICROM: CRYOSTAR NX50, CRYOSTAR NX70, HM560, HM550, HM525, HM520, HM500, HM505E, HM505N, HM365, HM355S (1, 2 AND 3), HM355, HM345, HM335, HM325, HM315, HM330. MILESTONE: DELTA PATHOS, PATHOS, HISTOS 5, HISTOS 3, RHS 1. Call for our coverage of other brands and models.